This bookmark is perfect for any age! While reading, we rarely want to stop the flow of a story to look up a word. One usually has an idea of meaning from context clues, but it would be nice to know what it means exactly. 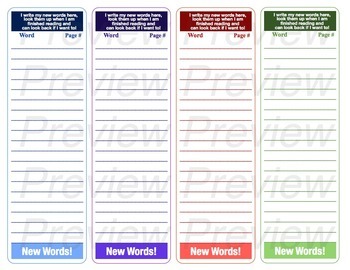 With this bookmark you can write down the new word with the page number it's on and look any new words when you are finished reading for the day. If a words meaning was totally different than what you expected, you can go back to the page and reread the section for better understanding quickly, because the page number is right there. 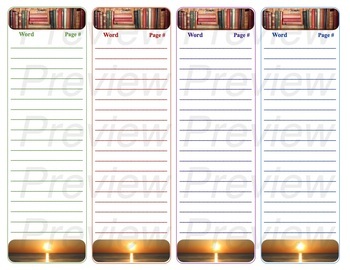 This bookmark comes in four colors but can also be printed in black and white. Best when printed on white card stock. Print two-sided using the short-edge binding setting so the back side isn't upside down. Visit JECamitzzi for more of my products. Contact me if you would like personally designed bookmarks.